COMIC SUMMERY what is demon road about? While on a mission as a royal messenger in training, Link finds a strange boy unconscious in the middle of the desert. Unknown to him is that this child is the prince of darkness himself, Ganon, having been betrayed and cursed by a mysterious demon. Unable to simply abandon the strange child, Link and his master adopt him into their family where he is to be trained as a messenger along side Link. Unfortunately, not all is smooth sailing as Ganon grows up with and befriends the spritely Link and incorrigible Zelda. During their adventures together he slowly begins to regain the memories of his former life and his betrayal. 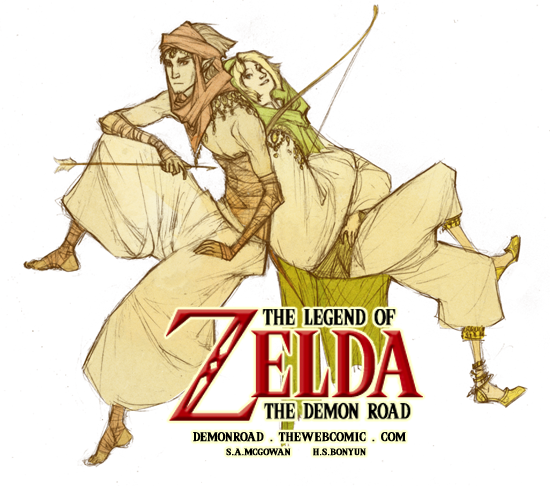 When his demonic adversary appears at the royal palace, Link and Ganon must save their friend and princess. But while Link and Ganon must work together to protect Zelda from the demon, as Ganon regains his former self, will Link and Zelda be able to protect themselves from Ganon?